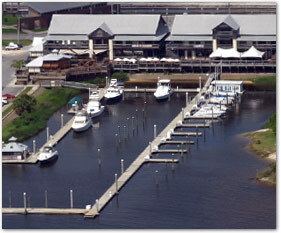 Seville Harbour is a two-story, 20,000-square-foot retail and office building overlooking Pitt Slip Marina, with a direct view of Pensacola Bay. The building is home to the Fish House, Atlas Oyster House, the Deck Bar and the Fish House Tackle Shop Gifts & Souvenirs. In addition, various businesses occupy a number of office spaces located throughout the complex. Currently, there are spaces available for lease.